A few times to take note of …. Due to the nature of yon entertainment, Some acts may perforce be a Trifle tardy or mayhap a soupçon early. Due to the nature of yon entertainment, Some acts may perforce be a Trifle tardy or mayhap a soupçon early. Please be understanding should Such occur & prepare for that possibility! 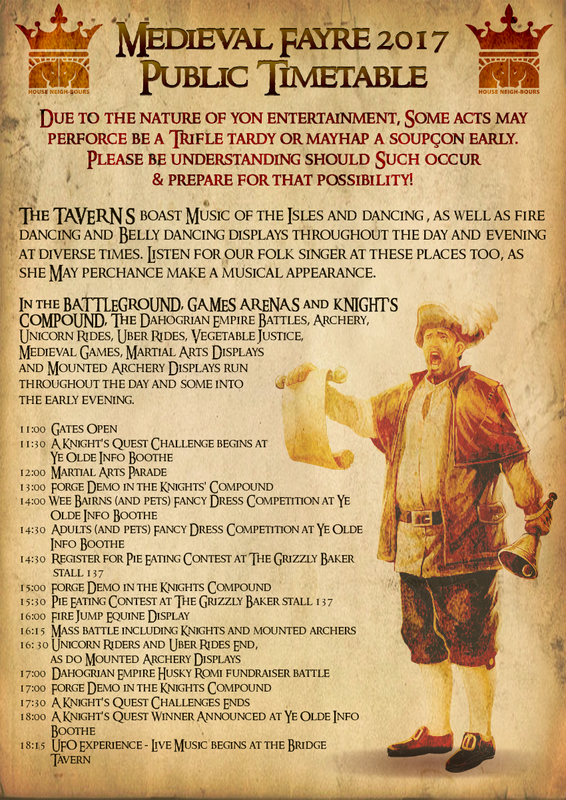 The TAVERNS boast Music of the Isles and dancing , as well as fire dancing and Belly dancing displays throughout the day and evening at diverse times. Listen for our folk singer at these places too, as she May perchance make a musical appearance. In the BATTLEGROUND, GAMES ARENAS and KNIGHT’S COMPOUND, The Dahogrian Empire Battles, Archery, Unicorn Rides, Uber Rides, Vegetable Justice, Medieval Games, Martial Arts Displays and Mounted Archery Displays run throughout the day and some into the early evening.